2016 JFK 50 – Blow up of BUST. Whether it’s a strength or a curse, when a difficult challenge is getting the better of me, I tend to kick into survival mode. This self-preservation method ensures completing a race instead of blowing up and not being able to finish. Going into this year’s pre-race dinner I hadn’t come to grips on a goal. From the time I first ran the JFK in 2014, I wanted to break the 10-hour barrier but like finding the elusive Yeti I have not uncovered this goal. During dinner I was asked by a member of US Military Endurance Sports team what my goal was, I replied: “Running a sub-10 hour JFK or blowing up in the process.” It was either the hype of the race, the flowing testosterone at the table or I had overdosed on spaghetti but I vowed to blow up or finish with my coveted sub 10-hour run. 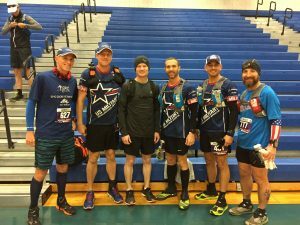 “The start of a race will not win the prize or ensure your record time, but it will surely lose it for you.” This adage rang out in my head as the 54th annual JFK 50 gun went off and we started our run out of Boonsboro, Md. From the climb out of town to the rocky trails of the Appalachian Trail (AT) the start of this race must be treated with respect. Burn out your legs by going out too fast and you’ll have to live with that damage for more than a marathon. The altitudes gains within the first miles must be managed in a method that conserves your energy for the 35 miles that wait after the AT. The trails and footing of the AT must also be treated with reverence to ensure survival. Running the AT can only be described as a test in foot placement, balance and lightening quick reflexes. Shortly after the race, I asked one of our rookie runners how he would describe the AT section, his reply nailed it. “Rocks, roots, more rocks, some more roots and an abundance of jagged rocks that could snap your ankles and maybe worse.” I thought he nailed it. The rocks of the AT are violent, razor-sharp projections protruding from the ground at angles and distances that constantly have you on guard. These random formations of tilted edges, slanted flats, and domed surfaces have no rhyme or rhythm to their flow. These toe catchers stick out of the ground at varying heights waiting for an unexpected collision to throw you off balance and a near certain and devastating meeting with the ground. Take your eyes off the trail for an instant, lose your focus, daydream to some happier place and surely you’ll have an unexpected meeting. Looking back at my lap times I’m surprised I was able to take 12 minutes off my best AT time. Clock time alone does not give an accurate picture of how fast it felt like I ran this section. My mind was glued on the trails. My eyes fixed on the next landing spot. I moved fast landing quickly and lightly. With my mind on a PR time this early in the race I ran as fast as I could over this the most technical part of the course. One of the reasons this part of the race can be deceiving may be that your foot action is much faster than the pace you may be running. Where your normal race pace maybe made up of long strides here your pace is a collection of numerous short, compact, jerky strides searching for the ideal place to land and push off without subjecting your feet and ankles to a violent off balance position. At times it felt like I was making a good time and at others, I felt like I would be on this trail forever. The mental work of maintaining your pace while your attention is glued on the course can be exhausting. The AT offers the runner no time to zone out and disappear in the run. For 15 miles you have to be on your game whether you’re battling the climbs or the rocks. Lose focus here and your race will be upset. I was about to lose the mental war when I heard cowbells and asked a runner in front of me if we had reached Weverton? His reply was music to my ears, “Yes.” Hot Dawg, now all I had to do was make it down the rapid and razor sharp switchbacks of the infamous Weaverton Cliffs. Although a sight for the runners eyes, miss-handled a step here and you could end your race on a stretcher. I was off the AT 15.5 miles into this race at 3 hours 06 minutes. Whereas the AT requires your ever present attention the C & O canal towpath allows you to mentally turn off and simply run. This can be a double edge sword. After coming off the AT like years past my legs were dead. The rapid pace, shifting running style, and the climbs had taken their toll. Now I was faced with 26 miles, 26 miles lay out in front of me and 26 miles would be challenging me to keep up the required pace. These 26 miles would provide an opportunity to gain ground on your goal or to lose it. This edition of the JFK would be different. In 2014, my 1st JFK I took on the JFK alone, in 2015 6 friends ran the race but our pace and goals did not align. This year rookie runner Josh would be my running partner for the day. Josh is a good friend, a bit faster, and younger than me. We developed a tow path plan of running for 9 minutes, walking for 1, and repeating this for as long as we could. I had chased Josh all through the AT, and I was not going to lose him now. I’ll condense this section with a simple catch phrase, rinse and repeat. We held up the 9/1 plan for over half of the towpath, then resorted to 8/2, and finally 7/3 until we hit Dam #4 and the asphalt that would lead us to Williamsport. My foot hit the first stretch of surface road with 7:56:06 on the clock….with little over 2 hours to run 8 miles I knew a sub 10-hour finish was a possibility. I also knew I was holding Josh back. In the last few miles of the towpath, I told him to run his race once we hit the roads. We ran as a well-oiled machine thru the AT, the tow path, and now he had to run his race. It was so nice to get my feet on solid level ground even if that meant facing a 900-yard climb right off the bat. The 8 miles of roads taking you to Williamsport are rolling country roads which on a normal day would offer little challenge. At the end of the JFK with 42 miles on your legs, they can be tough. In prior years I’ll “Ultra walked” even the slightest hill and ran the downhill’s and flats. After the monster climb at mile 42, I vowed to run everything I could. Seeing familiar markers of my walk breaks in the past this year I coaxed myself to run to the next hill or the one after that in an effort to keep up my sub 10-hour finish on the table. In the meantime, Josh punched out and was out of sight. In years past my JFK run had been blessed with wonderful weather, temps cool in the morning and warm during the day. For 75% of this year’s race, the pattern followed suit. Then the weather turned ugly adding an additional challenge. The weather shift started with a simple drop in temperatures and high winds along the last miles of the towpath. On the roads to the finish, the skies cast freezing rain down upon us. With 4 miles to go, I was all in…I ran everything I had. The aid stations every 2 miles were my only breaks as I ran for my coveted time. During the closing miles of any endurance event if you have managed your body, not burned out, and are able to maintain a running pace you can pass a lot of fellow runners on the way to the finish. At mile 4 it became a near constant game and motivational tool for me to knock off the next runner in front of me. Although I’m never racing the other runners it’s still uplifting to pass people after a long day on your feet. When the marker signifying 2 miles remained appeared along the side of the road I did something I never do during a race…I pulled out my phone. In the gusting winds, with frozen rain drops bouncing off my shirt, and with numb fingers I dialed a familiar number. “Hello.” my wife answered on the other end of our digital connection. Between heavy breaths, I tried to communicate, “Honey, 46 minutes, with 46 minutes…I have 2 miles to go. 2 miles for a sub 10-hour finish.” Something in hearing her voice and those words it got to me, my voice cracked. I don’t know what it is about the extreme physical events but I break down watching people reach their goals and now knowing that I was capable of reaching mine it got to me. I’m almost there, I thought to myself. I almost have my goal, I’m almost done with my third JFK and I can almost get out of this cold wet gear. I smiled back at her and pushed harder still until I crossed the finish line in front of Williamsport High school. I crossed the same finish line the JFK has had for 54 years, the same finish line where hours before Jim Walmsey broke the course record and the same finish line that one year before left me dejected and defeated. Today I crossed this finish line at 9:36:27 with a 30 minute Personal Record to claim my third JFK 50 finish. This entry was posted in Uncategorized on November 26, 2016 by burk.brian@yahoo.com. Awesome race recap! I hadn’t heard of the JFK50 before but now I want to work up to it! I’m about to attempt my first ever Marathon, L.A. Marathon, and 26.2 miles feels LOOOONG! I can only imagine 50 miles! Thanks for sharing your experiences, I’m definitely going to start following your Blog! If you get the chance, check out mine. I feel like we have very similar running goals!